There is an urgency to the issue of sustainability in the fashion industry. When you hear Swarovski’s sustainability expert saying “our lifestyles are not sustainable”, you know the message is getting through, and brands, large and small, are going to have to start addressing their role in the industry’s darker side: are they part of the problem or part of the solution? The Lone Design Club, a collection of fashion and lifestyle brands with a focus on traceable, mindfully-made products, organised the Mindful Makers evening to discuss sustainability and its importance in the design world. Rachele Gonzaga from Swarovski spoke about the ways in which big brands can use their money and influence for good, describing the responsibilities that these companies have to the communities where they operate. Reducing pollution through clean water initiatives and improving worker empowerment through education are priorities for Swarovski, as well as a commitment to sustainable innovation. Rachele also talked about her work as a personal stylist, where she encourages people to think about what difference they could be making at an individual level. I very much approve of Rachele’s method: she suggests looking through our wardrobes carefully, working out what we aren’t wearing and why, and having old pieces upcycled or altered to suit our current personal style. She also suggests buying less but buying better, looking for seasonless, versatile clothes. I’m not the biggest fan of a capsule wardrobe for myself, but I agree that we are all buying more than we need and we need to reflect on why we buy. Rachele also pointed out that no brand is going to be 100% ethical, so rather than worrying about not being perfect, we should support the brands that focus on the issues that are important to us, whether that’s worker’s rights, sustainable or recycled materials or zero-waste design. 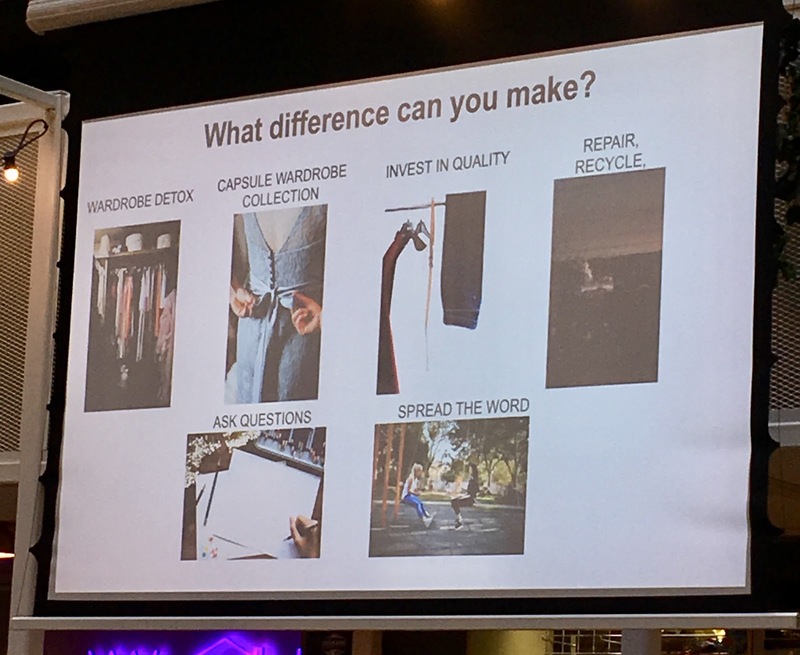 Olivia Pinnock, a freelance fashion journalist and lecturer, spoke about the ways that sustainable brands can communicate the benefits of the way they operate to consumers. 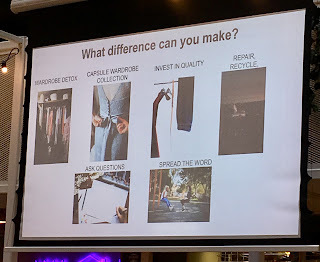 There is compelling evidence that consumers do care about sustainability; there was a 30% increase from 2017 in online engagement during Fashion Revolution Week, with customers asking brands “Who Made My Clothes?” However there is also evidence that sustainability doesn’t attract customers, it retains them. The product has to be appealing in its own right. Olivia emphasised the importance of clear communication with a positive emphasis on the advantages of sustainability. She suggested creating a community of shared values, telling a story rather than talking down to people. She also explained the importance of transparency: it levels the playing field and improves customer trust, while greenwashing hurts everyone. Certification (e.g the FairTrade label) can be a good way of communicating a brand’s values to customers, but this can be expensive, so endorsements from sustainability community leaders can also be a good indicator of a brand’s commitment to its values. LDC’s Mindful Makers event showcased brands that have sustainability at the core of what they do, while creating beautiful and desirable products. 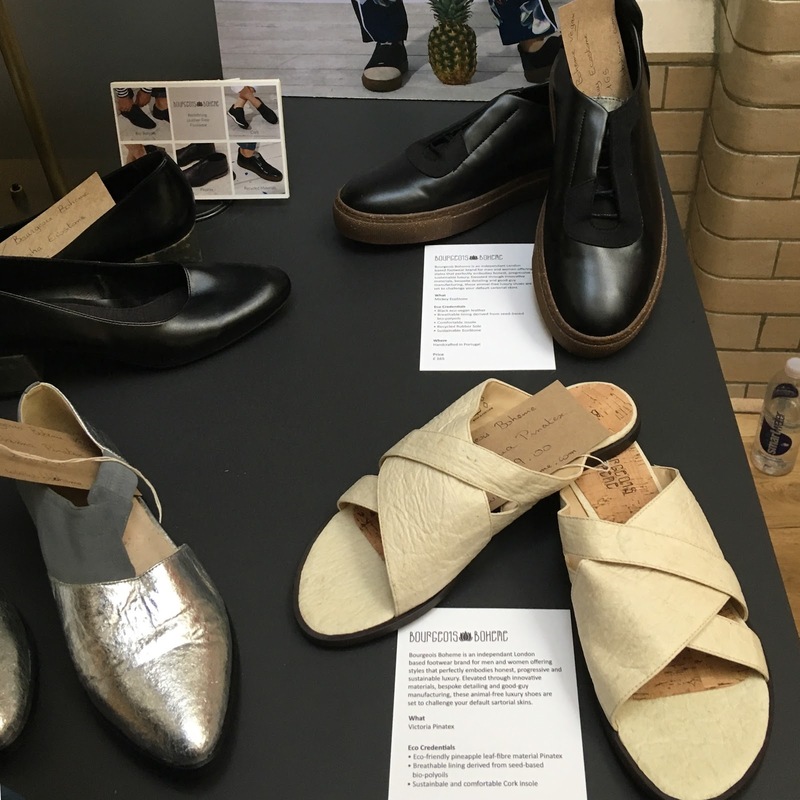 Bourgeois Boheme have sleek and stylish vegan shoes, with smart formal styles as well as summery sandals. 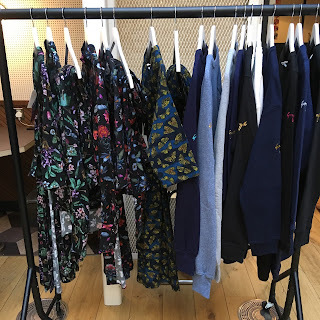 Gung Ho's statement sweatshirts and printed wrap dresses are very Instagrammable, as well as carrying a serious message about wildlife. Ware London's jewellery is eye-catching and futuristic, with gorgeous sculptural pieces created from vegetable tanned leather, and recycled rubber and silver. 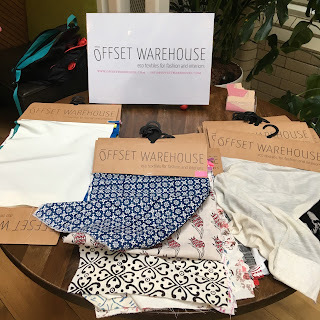 Sophie from Gung Ho, Alicia from Bourgeois Boheme and Emma from Ware London were joined for a Q&A session by Charlie from Offset Warehouse, who source ethically made and sustainable fabrics. 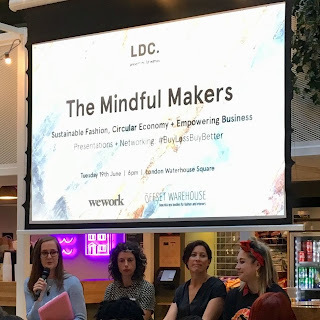 The panelists talked about how they hoped their products could help customers to shop in line with their values, and how their brands could encourage people to see sustainable fashion as an aspirational lifestyle choice. 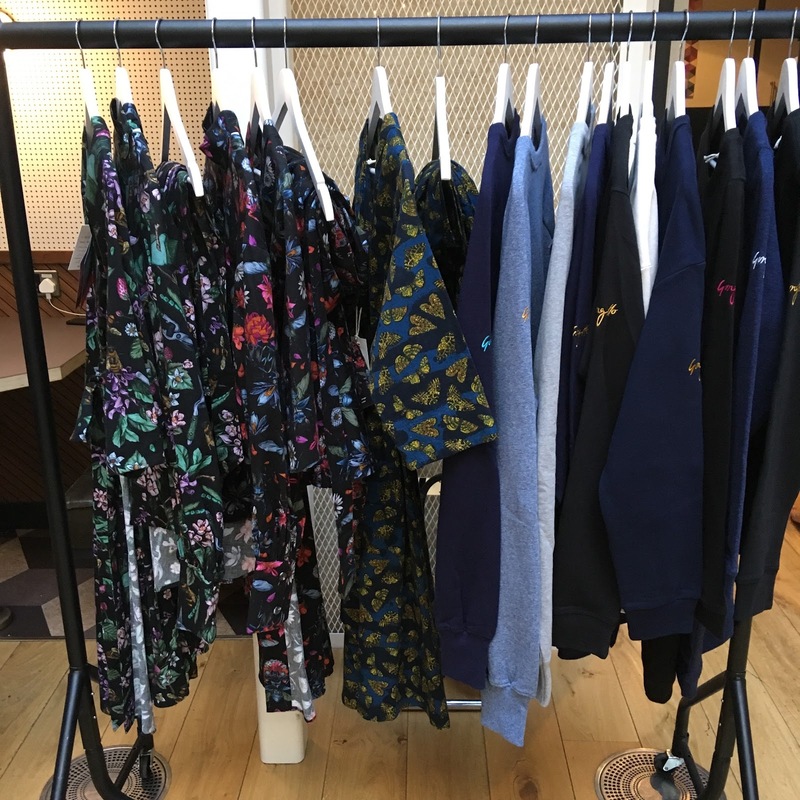 Sophie described Gung Ho as a brand for people who are “more than just a pretty face.” Our clothes are one of the first things people notice about us, they ought to show our interests and the things we care about. Alicia spoke about the extra research she does to make sure she is using the best factories and materials. Shoe construction is really complex, but they are constantly working on ways to make their products as sustainable as possible. Emma is living her brand’s values by living mostly off-grid, but still questions every decision when it comes to her products. I agreed wholeheartedly when she said that we have lost our connections to our surroundings. 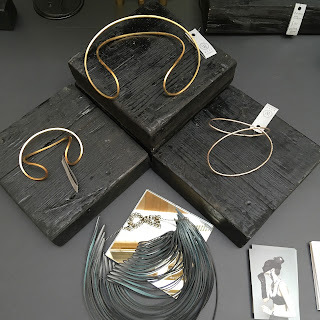 Sustainable fashion that uses interesting and unusual materials, like Pinatex, eco-stone or bicycle inner tubes can bring our attention back to the origins of the things around us that we take for granted. The panelists agreed that legislation was needed to stop the overproduction and waste generated by fast fashion, but sustainable fashion brands could point out the shortcomings of the high street by emphasising their own selling points. For example, advertising jewellery made from FairTrade silver will alert curious customers to the fact that other brands are not using FairTrade materials. The issue of the high cost of sustainable fashion relative to high street fashion came up in the Q&A, with different panelists having interesting takes. Olivia pointed out that although prices are higher than the cheapest end of the high street, they are actually comparable to mid-range retailers, and considerably cheaper than designer labels. Drawing those customers with plenty of disposable income away from the high street would be a sensible marketing strategy for brands who specialise in sustainable luxury. 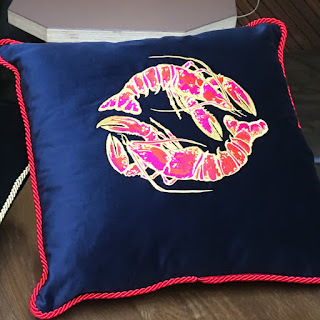 Sophie sells her Gung Ho designs at different price points to attract a wider range of customers, and Rachele pointed out that buying a lot of cheap clothes that you aren’t satisfied with, rather than a few pieces you really love, works out more expensive in the long run. sustainable fashion, this would be a great opportunity to meet designers and find out the stories behind their products. Imagining the stories behind clothes was what drew me to start shopping for vintage clothes as a teenager, and has driven my passion for costume making, so finding a community where the story is a key part of the product is a constant source of delight for me.